Funding would be earmarked for scientists and others engaged in researching water quality, habitat quality, fish and wildlife, and other topics. April 15, 2019 — The Connecticut Audubon Society is calling on residents to show federal officials their support for a new national reserve created to bring in funding for scientific research and conservation education — and it’s as easy as sending a letter or an email. What is the reserve and why is it significant for conservation? 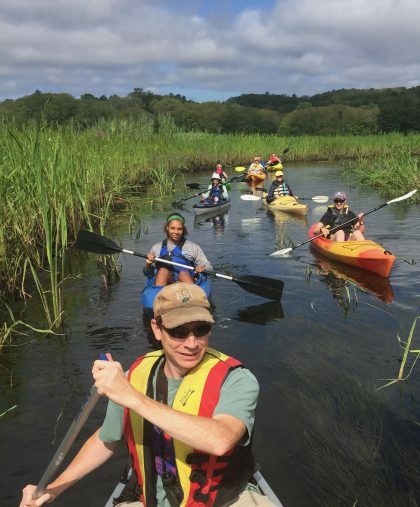 The National Estuarine Research Reserve would include some of the best wildlife habitat on the Connecticut River estuary and in southeastern Connecticut, including coves, islands, and marshes in Old Lyme. Now under consideration by the National Oceanic and Atmospheric Administration (NOAA), the proposed reserve encompasses the Lord Cove and Great Island Wildlife Management Areas in Old Lyme, and Bluff Point and Haley Farm State Parks in Groton. The research reserve is a project of NOAA, the Connecticut Department of Energy and Environmental Protection, the University of Connecticut, and Sea Grant. The inclusion of the Old Lyme areas is significant because the lower Connecticut River is globally important for conservation. The mouth of the Connecticut River and the estuary are unusual if not unique in the eastern United States because, without a big city on its shores, it has remained relatively undeveloped—a vast area of extraordinarily high quality habitat. What is the reserve’s potential for research and education? As much as $1 million a year in funding for scientific research and monitoring, education, and stewardship is at stake. The funding would be earmarked for both sections of the reserve, to be used by scientists and others engaged in researching water quality, habitat quality, fish and wildlife, and other topics. The reserve would also be a site for local education programs such as Connecticut Audubon’s Science in Nature, which has reached more than 75,000 school children in Connecticut. Why is public support needed? The federal government, which is providing the bulk of the funding for the project, wants to see that Connecticut residents support the reserve because the state would ultimately manage it. Local support for creating the reserve likely means continued support of the state staffing and carrying out programs there. Connecticut residents already demonstrated strong interest in the reserve when more than 100 people attended a public meeting about it in November. Connecticut Audubon is urging the public to tell federal officials that local support for the reserve is still high by contacting NOAA directly. To urge federal officials to create the National Estuarine Research Reserve in Old Lyme and Groton, copy and personalize the sample letter below and send to the address shown by April 26, 2019. I am (We are) writing to express support for the timely review of Connecticut’s nomination package to establish a National Estuarine Research Reserve (NERR) in areas of Long Island Sound, the Connecticut River estuary and Bluff Point and Haley Farm State Parks. The proposed Connecticut NERR provides critical habitat for birds, fish, and other marine and coastal species of plants and animals in the region and will add valuable scientific contributions to the national NERRS program. The proposed CT NERR site has received the enthusiastic support of state, local and private organizations and community leaders who recognize the benefits locally and nationally of additional research and knowledge regarding our estuarine environment. The proposed CT NERR will help provide valuable opportunities to advance relevant science, monitoring, education and stewardship efforts. We expect to rely on practical tools, provided by regionally-knowledgeable environmental experts that are connected to the work of other Reserves as well as the national program. The expertise of the NERRS are nationally significant and locally relevant in helping coastal communities protect and manage vital estuary systems and become more self-reliant in facing the increasing environmental challenges of changing climatic conditions. I (We), therefore request your timely review of nomination for the Connecticut Reserve, followed by its designation.